Are Small Businesses Being Heard This Election Year? President Barack Obama and Mitt Romney have talked frequently about small-business owners and entrepreneurs in their stump speeches recently, suggesting they're in touch with America's nearly 30 million small enterprises. But, when it comes down to it, how strong of a voice do small businesses really have this election season? According to many business owners and experts, not very. While the presidential candidates love to talk about small business, they often end up showing how disconnected they really are, says Carol Roth, Chicago-based author of The Entrepreneur Equation (BenBella Books, 2011). Many of the issues trumpeted as "small business" concerns, such as corporate taxes, labor laws and employee health insurance, are actually more vexing issues for big business. "I think there's a fundamental misunderstanding of what small businesses are in this country," Roth says. "Most small businesses don't have a corporate structure" -- or even employees. More than 70% of U.S. small businesses are one-person operations, she adds. Though sometimes big- and small-business interests are aligned, many times they are not. And incentives that help big corporations grow bigger might only make it harder for small companies to compete. There's a patchwork of national and local membership organizations that lobby on behalf of small businesses, including the National Federation of Independent Business, the U.S. Chamber of Commerce and the National Small Business Association. These groups often poll their members to gauge priorities and create their political agendas. However, some groups have come under increased scrutiny over their funding and political spending. In June, 70 Democrats in the U.S. House of Representatives signed a letter to NFIB's president, Dan Danner, questioning the 350,000-member organization's ties to "corporate-funded activist groups" in its fight to strike down federal health-care reform. It pointed to a $3.7 million donation NFIB received from Crossroads GPS, a Washington, D.C.-based conservative advocacy group backed by Republican strategist Karl Rove. The representatives requested that NFIB disclose its funders over the past three years, which it has not. NFIB spokeswoman Jean Card says the organization does not reveal its financial contributors, but that it determines which issues to support and champion solely by balloting members twice a year. While nonpartisan, NFIB predominantly endorses Republican candidates, she says, because they best represent the political positions and concerns of NFIB members -- especially on key issues such as health care costs and taxes. "We set our policies in a truly democratic way," Card says. "We actually don't care what party our members belong to." Yet, experts say some small-businesss owners still feel unrepresented. Gregory Fairchild, a professor of business administration at University of Virginia's Darden School of Business, says big corporations far outspend small businesses on political campaign contributions and that greatly diminishes small businesses' political clout. He believes the problem has worsened since the U.S. Supreme Court ruled in 2010 that government cannot limit corporate political spending. Small businesses are "most worried about opening the doors every day," he says. "They don't have public affairs budgets." Another dilemma, Fairchild says, is that small businesses are very diverse: An auto-parts maker with 250 employees has different political concerns from a high-tech start-up with 10 employees or a one-person consulting firm. 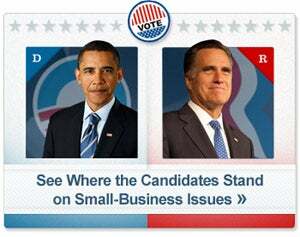 So it's hard for candidates to rally around "small-business issues" when there's no one set of them. That aside, Fairchild says politicians who truly want to demonstrate an understanding of small firms should address topics that more squarely aimed at them. For instance, a four-year tax holiday for start-ups or providing mortgage relief to entrepreneurs -- who often tap home equity for funding -- would relieve many small business owners and help spur business growth, he adds. Democrat-supporting or independent business owners may feel particularly underrepresented in elections because many of the membership organizations, like NFIB, often throw their support behind Republican candidates or align with Republicans on key issues. However, a poll earlier this year by Small Business Majority, a small-business advocacy group, found that 44% of owners identified themselves as Republicans, 38% as Democrats and 10% as independent. Mitch Goldstone, owner of ScanMyPhotos.com, an Irvine, Calif., photo-digitalizing company with 18 employees, supports Barack Obama. He feels there's too often an assumption that small-business owners vote Republican because of their push for lower taxes and less regulation. Yet, many business owners consider other matters that can affect their business, such as education, the environment and immigration. "I care a lot about the social issues," he says. Goldstone believes federal health-care reform will provide small businesses more options for covering their employees and that raising taxes on corporations and closing corporate tax loopholes could ease the tax burden on many small firms. 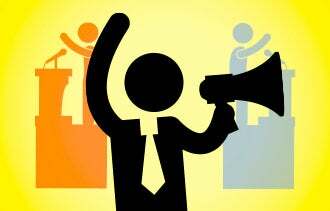 The National Small Business Association, a lobbying group with 65,000 members nationwide, does not endorse candidates and has found that typically its members are split fairly evenly between the two major parties and independents, says Chris Holman, NSBA's chairman. But he acknowledges that even as an organized group fighting for small-business issues, it's difficult for them to get politicians to genuinely take up their causes. "There's a lot of cheerleading for small businesses and then voting against it," he says, adding: "All you have to do is look at where the money comes from." That's not to say, however, that Washington never tries to help small businesses. Two recent "small business" bills -- one from Republicans that would provide tax cuts to firms with 500 or fewer employees, and one from Democrats that would provide tax breaks to firms that create jobs or give employees raises -- were introduced, but both failed to win enough Congressional support. Many small-business owners, however, say their needs go beyond just sweeping tax cuts. And many Republican-supporting business owners -- who are better represented by the membership organizations -- don't feel like their candidates really understand them. Bob Weil, owner of Visual Sound, an eight-employee maker of guitar gear in Spring Hill, Tenn., has written a proposal to reform accounting rules that he recently presented to his local U.S. congresswoman's office. He wants tax relief on excess inventory and faster depreciation on all asset purchases. He supports Romney because he believes "government shouldn't get in the way" of business, explaining that he feels Obama's policies have hampered his business more than helped it. Weil, however, feels that even Romney doesn't really grasp small-business struggles -- because he, like most politicians, has never run one. But Weil thinks election talk hardly matters, anyway. "Election years are full of rhetoric and promises that are never kept," he says. "It's what happens between election years that matters." Corrections & Amplifications: An earlier version of this article misspelled the name of Mitch Goldstone, owner of ScanMyPhotos.com.